As sound technology in the movie industry gets ever more refined, the screening rooms of film distributors also need to stay in step and at the cutting edge of audio technology. At the Amsterdam facility of Universal Pictures International (UPI), an Alcons Audio CRMS mkII cinema reference monitor system is ensuring that those attending film screenings enjoy the best audio experience. Opened in 2005, the facility was built to facilitate screenings for the press and industry professionals, rather than UPI having to buy out regular cinema showings for them. 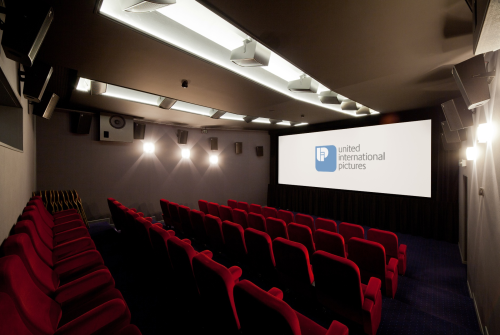 When it came to upgrading the room for Dolby Atmos, late last year, UPI contacted digital cinema specialists CinemaNext, whose Edwin de Winter specified the Alcons CRMS solution. Edwin designed the complete system for the room, which was installed by the CinemaNext team. The system comprises three Alcons CRMS MKII, three-way systems with two CB362 dual 18” high output, full size subwoofers, two CB151sl single 15” compact shallow subwoofers, flown in the back of the room, plus 28 CCS8 medium format surround units. The system is powered and controlled by Alcons Sentinel3 amplified loudspeaker controllers. Delivering the most natural, high definition sound reproduction possible, the CRMS mkII features the patented RBN401 pro-ribbon driver and combines remarkable clarity and intelligibility with high headroom SPL. Each CRMS mkII system features a separate mid-high frequency section, featuring a RBN401 4” pro-ribbon driver HF with non-vented 8” MF and a vented 15” low frequency section, with low power-compression 4” voice coil design. It is the ideal choice for high end mix or screening rooms, post-production facilities, dubbing stages and high quality home cinemas with a room depth of less than 20m (60’). Adriaan says that they are very happy with the system, which has received positive comments from those attending screenings. And it is not only the latest movies that sound better. More info on www.universalpictures.nl , www.cinemanext.nl and www.alcons.audio .